What Does Moderate Exercise Mean, Anyway? It’s one of the guiding principles behind fitness recommendations. But patients often are left wondering: What does moderate really mean? In the exercise world, we think of moderate-intensity activity as anything that gets your heart rate up to 50 to 60 percent higher than its rate when you are at rest. Different groups — from the American Heart Association to the Centers for Disease Control and Prevention — have slightly different recommendations. 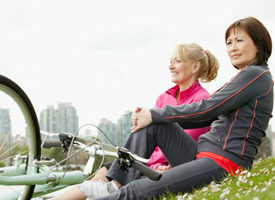 But in general, they advise 150 minutes per week (that’s 30 minutes five days a week) of moderate-intensity activity. You’ll notice all of the durations on the list are more than 10 minutes at a time. That’s because 10 minutes is the minimum amount of time you need to get the benefits of cardiovascular exercise. I often tell patients to start with 10 to 20 minutes of any activity and work your way up. If you’ve been living a sedentary life, or if you have medical conditions that limit your activity, you need to ease yourself into fitness and see how your body responds. You’ll also notice that all of the above are cardiovascular exercises. When you’re crafting an overall fitness plan, be sure to incorporate strength training, too. Want a simple way to tell if you’re in the moderate zone? Use the “talk test.” When exercising at moderate intensity, you should be able to talk to others without gasping for air. Speaking will take a little more effort than usual, but you should be able to carry on a conversation. However, if you want to be more scientific, you can start by defining your resting heart rate. Do this by taking your pulse when you first wake up in the morning. Subtract your age from 220 to get your maximum heart rate. Next, subtract your resting heart rate from your maximum heart rate. Multiply that number by your percentage of training intensity. Then add your resting heart rate to get your target heart rate. Here’s the truth: I never want complicated math to scare you away from exercise. If you are interested in using formulas and heart rate monitors, I encourage their use. A doctor or exercise specialist can even help you get started. But if you prefer to skip the math and just incorporate the exercises above or others into your life — and you’re healthy enough to do so — you are still on the right track. What matters most is that you get moving.